The word “taqwa” comes from the Arabic root letters wa, qaf, and ya. Its meaning is broad, signifying consciousness of Allah (SWT), love and fear of Him, and righteousness. In Quran, Allah (SWT) uses the word taqwa 151 times. We read these verses and get in-depth understanding of what this word really means as we ponder its profound significance. We realize that taqwa is a shield which prevents us from doing immoral acts. We internalize that Allah (SWT) sees and hears all things, and this awareness keeps us away from sins. One time, some companions asked the Prophet (peace be upon him) about taqwa. He tapped his fingers over his chest and said that “taqwa is here.” He repeated that three times. This indicates that taqwa involves more than an intellectual grasp of the divine reality. Consciousness of Allah (SWT) must enter the heart and inform one’s character, so that love and fear of Him bears its fruit in a person’s actions. A farmer knows the secrets of getting a good harvest. He chooses a good location with plenty of sunlight, cleans the ground from weeds, ensures that the soil is fertile, plants good quality seeds, and gives the right amount of water. He continues to work hard for a good harvest. In the same way, if we want to cultivate taqwa in our hearts, then we have to locate ourselves well — surrounding ourselves with good people, sound ideas, and wholesome pleasures. Once Umar (r) queried Kaab (r) about taqwa. Kaab (r) then asked Umar (r) if he had ever walked through a thorny path. Umar (r) said that he had done that many times. Kaab (r) then asked Umar (r) to describe how he moves amongst the thorns. Umar (r) responded that he walks carefully with all his clothes collected close to his body so they are not ripped by the thorns. Kaab (r) said that this is the answer to his question about taqwa. Indeed, this world is a place surrounded by the thorns of temptations, provocations, deceptions, and pretenses. We must carefully tread this life’s journey to protect ourselves from the traps of Shaitaan, our own base desires, and worldly snares. If we are successful, then we are a “muttaqi” – a person with taqwa. How Can We Attain to Taqwa? In Surah al-Baqarah, Allah (SWT) says, “O mankind! Worship your Lord, Who has created you and those before you, so that you may become righteous [attain taqwa]” (2:21). This verse indicates that if we really want to cultivate taqwa in our hearts, we can do so through ibadaat, our acts of worship, like fasting, daily prayers, charity, and other acts. As we increase the sincerity and devotion of our ibadaat, taqwa increases – we become more conscious of Allah (SWT), our love and fear of Him permeates our daily lives, and our behavior reflects our feelings of closeness to Him. We should keep in mind the full meaning of taqwa when we read Quranic verses. So when the translation of “ittaqullah” is rendered as “be conscious of Allah” or “fear Allah” or “be righteous,” the original in Arabic encompasses all the meanings. Allah will facilitate our self-reform and forgive our sins: “O you who believe! Be conscious of Allah (have taqwa), and speak words directed to what is right. He will [then] make your conduct whole and sound and forgive you your sins: he that obeys Allah and His Messenger, has already attained the highest achievement” (33:70-71). We will attain to an honored status: “Verily the most honored of you in the sight of Allah is [he who is] the most righteous of you [has the most taqwa]. And Allah has full knowledge and is well acquainted [with all things]” (49:13). The criterion for high ranking in the sight of Allah (SWT) is taqwa, not appearance, wealth, status, or other worldly attribute. We will find ease in affairs, have bad deeds pardoned, and our reward magnified: “… and for those who fear Allah [have taqwa], He will make their path easy… And if anyone fears Allah, He will remove his ills from him, and will enlarge His reward” (65:4-5). We will be able to discern right from wrong and have our sins forgiven: “O you who believe! If you fear Allah, He will grant you a criterion [to distinguish between right and wrong], and remove from you all evil and forgive you” (8:29). All the above blessings are available to us in this world and will result, insha’Allah, in earning the pleasure of Allah (SWT) and gaining us entry into Jannah with His mercy. Ameen. A farmer knows the secrets of getting a good harvest. He chooses a good location with plenty of sunlight, cleans the ground from weeds, ensures that the soil is fertile, plants good quality seeds, and gives the right amount of water. He continues to work hard for a good harvest. In the same way, if we want to cultivate taqwa in our hearts, then we have to locate ourselves well — surrounding ourselves with good people, sound ideas, and wholesome pleasures. Then we plants seeds of taqwa with devotion, nourishing ourselves with the light of truth. We also have to regularly clean our minds and hearts from negative thoughts and feelings, and enrich and soften the loam of our souls with our tears. There are countless ways to plant seeds of taqwa: a kind word, a charitable act, support of social justice, turning away from temptation and refraining from wrongdoing, a focused and sincere prayer, and so on. And remembering Allah (SWT) is a continuous dedication to producing a good harvest in our souls. The best time to do this is at tahajjud time when others are sleeping. We leave the comfort of our beds to remember Allah (SWT), to make dua to Him for qulb-e-saleem (a sound heart) and for nafs-ul-mutmainnah (a tranquil soul). Insha’Allah, He will accept our duas and give us the taufiq (good fortune) to remain conscious of Him always, to love and fear Him so that we follow His commands and the wisdom of His guidance, and to be of those who attain righteousness. 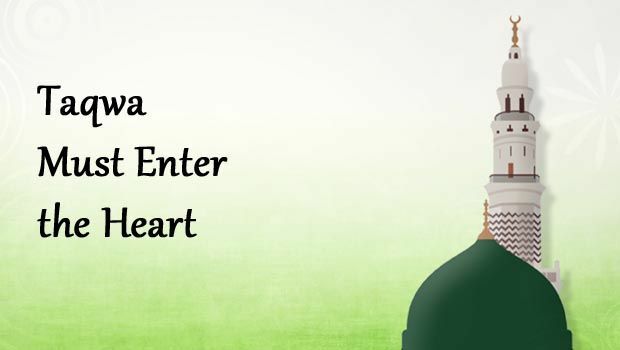 For then, taqwa has entered the heart. Ameen.